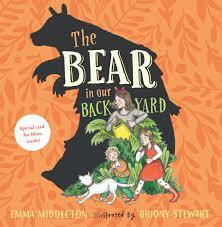 This is the second picture book by illustrator turned author, Emma Middleton and follows on from The Lion in Our Living Room. It’s another picture book where unreliable narrative collides joyfully with illustrations that force you to search and discover meaning. In other words, it is a glorious romp of hide and seek for Tom and Tilly where words and pictures do not always match up. Our two cheeky children are desperate to play with their mum in the backyard but she has warned them to watch out for the bear…in case she’s out there today. Bear is brilliant and fun but may be grumpy if she’s woken from her sleep. The children proceed cautiously, trekking her through the garden, attempting to entice her with sticky sweet treats, terrified they’ll wake her. And they do! Happily, their big, brown bear, now fully rested, is raring and roaring to play. She twirls and whirls with them until teatime then makes a lumbering departure but the children don’t despair because they know her love for them is strong enough and warm enough to share … even with a new, tiny baby bear. Middleton’s prose is lilting and merry, enchanting readers all the way to the surprise ending. Gentle rhyme maintains the musical quality of this story along with an enticing air of mystery and expectation. Stewart’s endearing illustrations engulf each page like a giant bear hug and cleverly give the illusion of a heavily pregnant mama as a big old brown bear. I especially adore the many little acknowledgements of the former book and its Lion character (aka Tom and Tilly’s dad) secreted throughout. Witty, clever and oozing with big-hearted affection, The Bear in Our Backyard is a definite winner to share with your kids especially if expecting a new baby bear into your family. Ace picture book partners, Young and Carnavas, hook up again in the fifth book of the immensely popular…My family member is a … series. This time the spotlight is on Mum in all her cape-touting, big-haired glory. 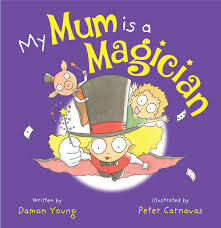 It follows the same premise of the former books like, My Nanna is a Ninja, examining all the various zany, kooky, common-placed things that other mothers get up to, but highlights the narrator’s magical mum and her amazing abilities like pulling piglets out of hats, making cards vanish, and casting secret spells. The most brilliant thing about this book and is predecessors, apart from Carnavas’s indescribable illustrations that contain more nutty humour than a block of Cadbury’s Fruit and Nut, is its ability to showcase a whole community of diverse cultures, behaviours and beliefs in a way that is 100% connectable with youngsters not to mention laugh-out-loud comical. Full on fun with mum and utterly spellbinding…what could be more magical than a bedroom that glows! (I’m staying up tonight to relive that page again). 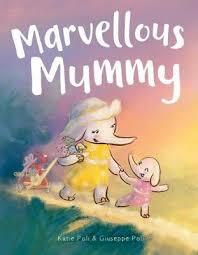 Celebrate your mum’s magical attributes with this captivating picture book. This book isn’t your average illustrated homage to notable humans of the female persuasion. It focuses on a selection of rather more oblique, less well-known women who have nonetheless made remarkable inroads on history. Boudicca, Pocahontas and Mary Shelly may spark recognition but did you now Elizabeth Blackwell was the first woman to ever be awarded a degree in medicine? Are you aware that an English woman named, Ada Lovelace inadvertently was the world’s first computer programmer…a century before the first computer was even built! 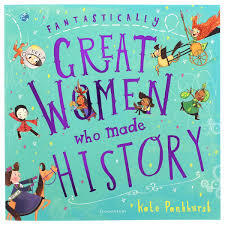 Like its predecessor, …Women Who Changed the World, …Women Who Made History celebrates inspirational women who in some way left their mark on the world in which we live. Their talent, ingenuity, tenacity and refusal to ever give up not only etched their names forever into history, but make for a vibrant collection of female role models, both young boys and girls can admire and learn from. Punchy narration teamed with vivacious, detailed illustrations, makes this non-fiction picture book a gem to own. Great for primary aged readers.